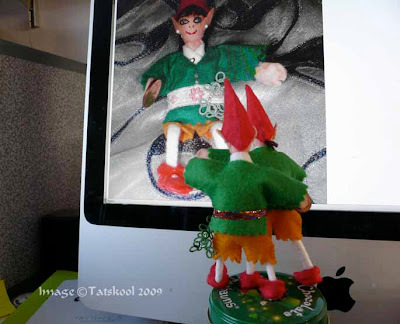 TATS A KOOL CHALLENGE: Leprechauns in love! I guess that the one most of you were interested in was THE GIRL! Well she landed safely in Idaho into the welcoming hands of Lady Shuttle Maker. You can see them here. They look so alike it's hard to see which is the leprechaun! I think they are going to influence each other a lot. I wasn't going to show Fergeal that blog post 'cos I know that he liked her...a lot. He tried to get her to stay, but she said "No! I want to travel while I am young enough and have no ties!" I think that I have heard that somewhere before! We all hope that there will not be a repeat of last year when Brendan decided that he hadn't travelled far enough! and wandered off. I can assure you (fingers crossed) that she is Brenda the stay at home..the homemaker. Blathnaid (Blon-ned...in Irish names you always lean on the first syllable) means flower...so we should be seeing flowery designs and HDT's in abundance from LSM. 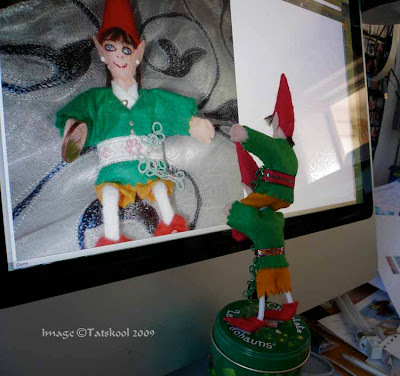 Well back to this post, when I went to get a cup of coffee, Fergeal spotted the open window on my computer from his office on top of my piano..dragged up his tin of Chocolate Leprechauns to climb on for a better look. 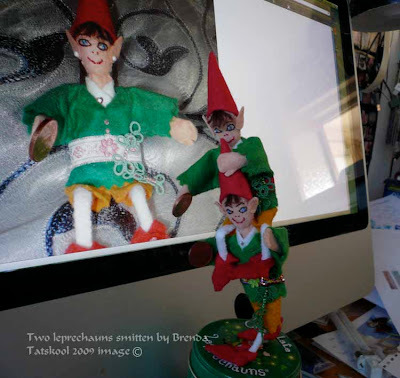 I left him there while I got my lunch ready, when I came back I was gobsmacked to see that where I left one, now there were two leprechauns admiring the photo and not only that but Fergeal had managed to enlarge it so much that she was almost in the room with us. In the blink of an eye Fergeal had lifted the other one on to his shoulders to get a better view. "What's going on here?" I asked rather feebly, 'What's he doing still here??" Seems that our Fergeal is lonely. He has seen three lots of leprechauns....just like him...well almost...arrive and then be sent away before he had chance to get to know them. "It's just not fair." he said. Then he began to try to justify his actions. he reckoned that as he was in charge this year and did all the advertising and all the interviews, that his workload had got so much bigger than stated in his contract.....so he decided that he was in need of an assistant.....and had talked young Tadgh into staying....promising him...well who knows what he has promised him!! I think we are going to here a lot more from him....as he and Fergeal are always together dreaming up some big scheme. In case you didn't know Tadgh is the Irish equivalent of Tim...it is pronounced Tie-gg. Don't forget to lean on the first syllable. Next time we write we will show you some more photos of Fergeal and Tadgh and some never seen before...photos of Blathnaid AKA Brenda before she left. 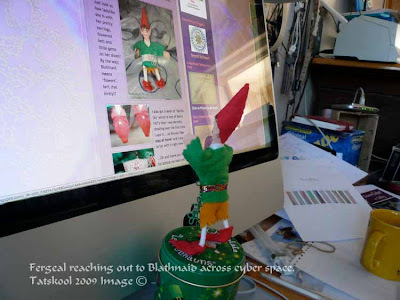 Oh the number of Leprechauns that are writing in saying they are smitten by Blathnaid is growing by the minute, whatever will happen next! Normal snowflake challenge service will be resumed tomorrow.....OK so I am just playing for more time!!! Aww, Fergeal has a friend now !Welcome, Tadgh! I can just imagine the lep shenanigans that are about to unfold. The captions on the photos are just too funny! Let's hope all this admiration doesn't go to Blathnaid's head and we hear about her posing for LepBoy. Naughty, naughty. LOL! I LOVE these little reports from everyone about the Leps! What fun! I think you made the right move sending Brenda off. It looks like you'd have your hands very full if you'd kept her there with those 2 hulligans! LOL! This post is AWESOME! I think it is very appropriate for Fergeal to have an assistant...I can't wait to see what they will be up to together. Brenda is taking in all the compliments with a blushing smile....she says that boys can wait...she has too many intellectual persuits and interests to be sidetracked by matters of the heart. She does say that she is open to friendship in the mean time though! I think she is such a sensible lass! Leorechauns, snowflakes....that's not playing for time, that is Christmas for all of us,and we are loving every word! Oh! You guys are too funny for words. You make my day. I keep forgetting that I still have to do all the Christmas stuff, I am in a time warp still stuck on the 12th of Dec!! I love reading about Fergeal's exploits. As we would have said back in elementary school, "Blathnaid and Fergeal sittin' in a tree, K-I-S-S-I-N-G..."
I appreciate your pronunciation guides, too. I do OK with the vowels in Irish names, but I can never figure out which consonants are silent. It's as bad as Welsh. What a cute post! I am glad to see that Fergeal has a friend! Tadgh is fortunate to have such a capable mentor! I think my lep is pretty smitten with her, too! LOL! OMGosh! I just looked over to see him leaning sideways to get a better view of the screen...it's like he knew there were pictures of her on the screen! LOL! Love, love, LOVE this post! Such darling set of leprechauns orchestrating shenanigans! You better set new passwords on your computer or you may find them racking up Internet charges for lovey-dovey calls to Blathnaid! A sensible lass indeed. Although, if the boys start serenading her via youtube with Irish love songs, or perhaps send gifts or flowers, they might stand a fighting chance, don't you think? OMG the things that they might get up to. I hope that they don't read the comments and see all those IDEAS! The temp fell to -2.6C last night, the coldest it has been for years. the garden looks so pretty with the frost. I know that this doesn't sound cold to most of you guys, but to us it's brrrrrrrrr! Welcome Tadgh!! I think these two will lead you on a merry chase!! What fun they will have together. They will keep you on your toes. I guess it's a good thing that Blathnaid is far away. William was thrilled to see more relatives moving to the states. How exciting!